How many times have you written an e-mail to your friends or at work and just wanted to make sure you made no spelling or grammar mistakes? This can be a time consuming process, but WhiteSmoke's English writing tool can make it a breeze. WhiteSmoke's writing tool provides you with solutions to all your writing difficulties. 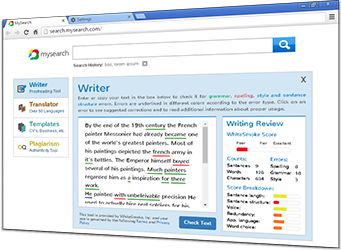 WhiteSmoke writing tool is the ultimate way to check and edit your text, based on Natural Language Processing (NLP). WhiteSmoke will not only check grammar and spelling mistakes, but will also edit and enhance your text. Accurate corrections - WhiteSmoke processes your text based on context, and therefore provides the most accurate corrections to your writing. Write like a pro - WhiteSmoke will edit and enhance your text in a way that will make your readers believe that you are a professional writer. Get feedback - WhiteSmoke will give you immediate feedback and a score on your writing according to accurate measurements. Try our online writing tool for free today, and assess the quality for yourself. 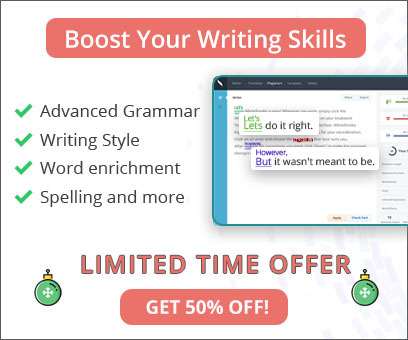 The WhiteSmoke writing tool consists of a grammar checker, a spell checker and dictionary software all in one package. These writing tools will make your writing more accurate and professional and impress anyone who reads your text.